Here we are in the midst of the holiday season. My favorite, Thanksgiving, is now a warm memory and my friends are starting post pictures of their Christmas trees on Facebook. I spent Thanksgiving Day with fellow teachers and friends from Prishtina High School, where I teach. It was a day filled with food and laughter. 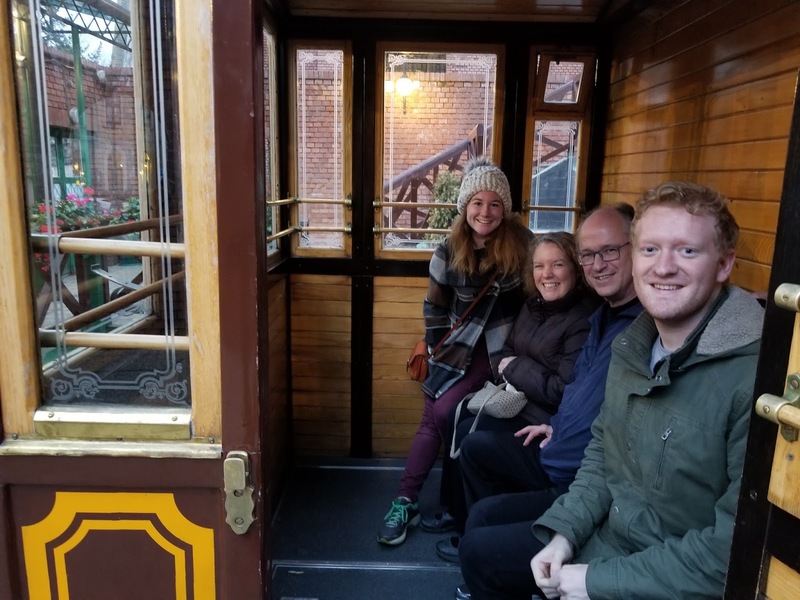 Of course the real treat for me came when I returned to my apartment and had the chance to spend the holiday with my family in the States via Google Hangouts. That sort of holiday would have been enough. Like a slice of warm pie. Perfect by itself but add a little ice cream or whipped cream on top and you have a dessert that is truly memorable. The cream in my case? Four friends with four backpacks and four more days of fall break. 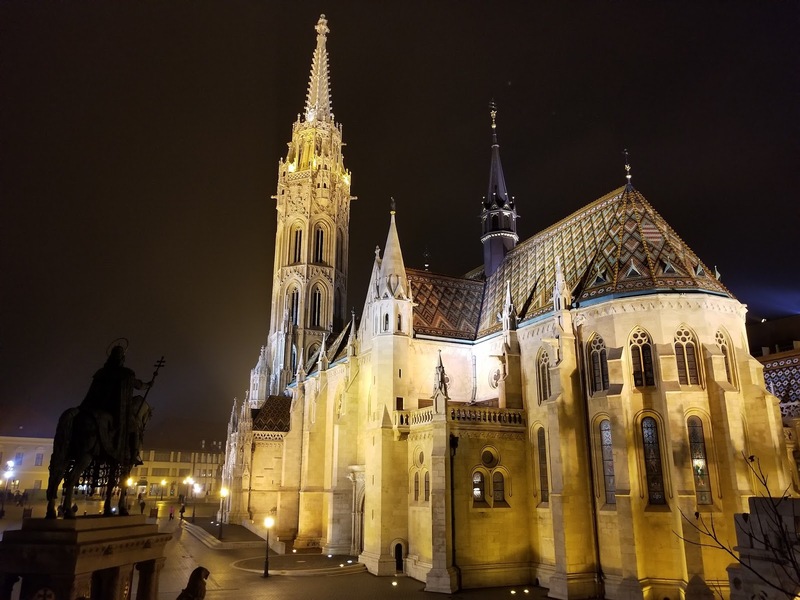 We caught a flight to Budapest where Stephanie had booked us lodging at a great Airbnb. A comfortable place to crash late in the night and play games after a long day of sightseeing. 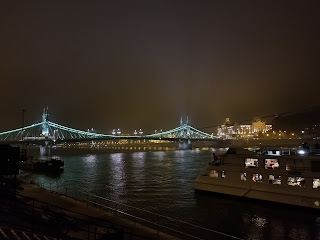 Bridge over the Danube at night. Budapest is so much bigger than I expected. It is a beautiful Eastern European city with ornate architecture and cobbled brick streets. The city is divided by the river…Buda on one side and Pest on the other. 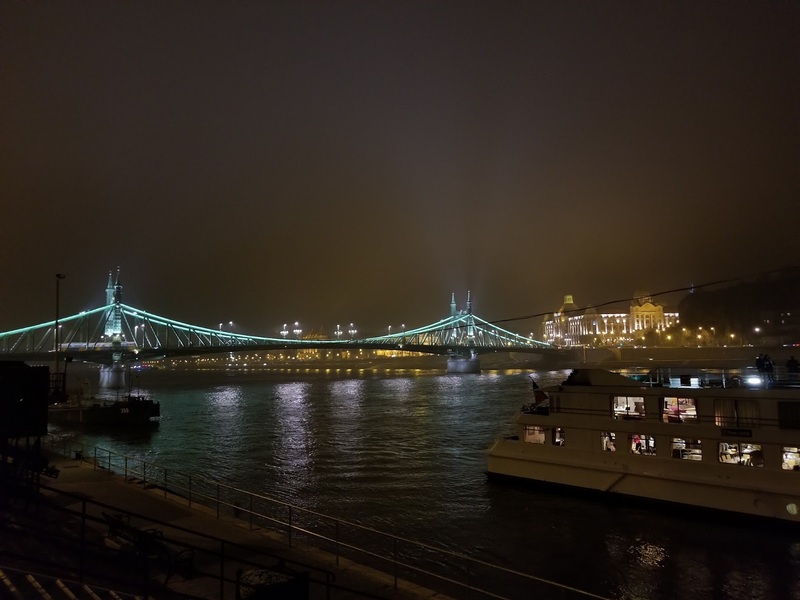 We stayed on the Pest side but walked across a bridge spanning the Danube to the Buda side where we explored the Castle District. This was my favorite of our sightseeing ventures. Castles, churches, and caves. One cave still serves as a church and the other one we explored was the underground Labyrinth that once served as a prison. Dracula was one of the more infamous guests there. The castle, poised high on the mountain overlooks the river and the entire city beyond. Matthias Church on the Buda side of the river. On the Pest side we poked around markets and second hand stores and an antique flea market of sorts. We visited several Christmas markets. The vendors selling crafts were fun, but the food was amazing. Chimney cakes baked over an open flame in front of us. Chocolate…everything. Pastries and grilled foods of all sorts. And instead of mulled apple cider they serve mulled red wine. Seriously. The Christmas market in front of St. Stephens Church. The very best part of the trip was spending time with friends. 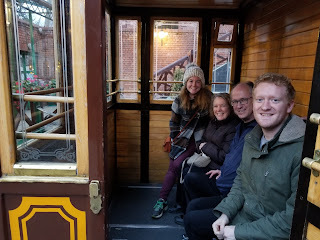 Eating breakfast in small cafes, enjoying a coffee at an out of the way shop, and being comfortable enough to enjoy being “tourists” together. This was my favorite breakfast place! Love the way the people in the background photo bombed! Great faces! As I’ve said before, teaching in Kosovo has its perks…and easy, affordable travel is definitely one of them! Join me as I spend these next months in Kosova (the Albanian pronunciation for Kosovo) in Southeastern Europe. Each week I share my experiences. Leave your comments and questions below. I’ll try to address each as best I can. A yellow rose outside the castle. This one's for you Danielle. One of the castle windows. looked out to view the river beyond.